Here at PhotoFairytales you can discover a lovely range of personalised wedding and anniversary gift ideas - and everything you see here is designed and made in Britain. No two weddings are the same, and that's why a bespoke personalised wedding or anniversary gift is perfect, and will become a cherished keepsake. Instead of the usual boring wedding present, why not opt for something truly individual and thoughtful to celebrate their (or your) wedding day? The PhotoFairytales online gift store offers great gift ideas, with unique and unusual handmade personalised wedding gifts that the bride and groom won't get from anyone else! 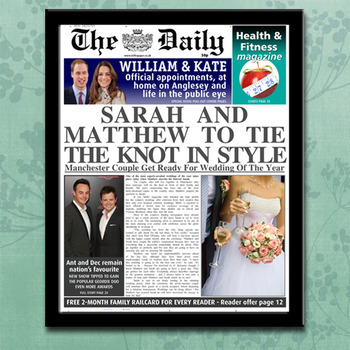 Or perhaps you're looking for a unique keepsake to mark your own wedding day? Here you will find some truly thoughtful present solutions, including handmade keepsake name gifts and personalised prints, personalised wooden horseshoes and name plaques, personalised hand painted anniversary, wedding or engagement gift plates, personalised canvas prints featuring any name and date, unusual photo gifts, special message prints, fun spoof Blue Heritage Plaques and much more. PhotoFairytales is the home of unique personalised wedding keepsake gifts that are a bit different - and everything comes with free UK delivery and fabulous service too.